Recently the NPR program Marketplace did a story about the rise of the use of dropout early warning systems in public schools that you can read or listen to online. I was lucky enough to be interviewed for the piece because of the role I have played in creating the Wisconsin Dropout Early Warning System. Marketplace did a great job explaining the nuances of how these systems fit into the ways schools and districts work. I wanted to use this as an opportunity just write a few thoughts about early warning systems based on my work in this area. Not discussed in the story was the more wonky but important question of how these predictions are obtained. While much academic research discusses the merits of various models in terms of their ability to correctly identify students, there is not as much work done discussing the choice of which system to use in application. By its nature, the problem of identifying dropouts early presents a fundamental trade-off between simplicity and accuracy. When deploying an EWS to educators in the field, then, analysts should focus on not how accurate a model is, but if it is accurate enough to be useful and actionable. Unfortunately, most of the research literature on early warning systems focuses on the accuracy of a specific model and not the question of sufficient accuracy. Part of the reason for this focus is that each model tended to have its own definition of accuracy. A welcome and recent shift in the field to using ROC curves to measure the trade-off between false-positives and false-negatives now allows for these discussions of simple vs. complex to use a common and robust accuracy metric. (Hat tip to Alex Bowers for working to provide these metrics for dozens of published early warning indicators.) For example, a recent report by the Chicago Consortium on School Research (CCSR) demonstrates how simple indicators such as grade 8 GPA and attendance can be used to accurately project whether a student will be on-track in grade 9 or not. Using ROC curves, the CCSR can demonstrate on a common scale how accurate these indicators are relative to other more complex indicators and make a compelling case that in Chicago Public Schools these indicators are sufficiently accurate to merit use. However, in many cases these simple approaches will not be sufficiently accurate to merit use in decision making in schools. Many middle school indicators in the published literature have true dropout identification rates that are quite low, and false-positive rates that are quite high (Bowers, Sprott and Taff 2013). Furthermore, local conditions may mean that a linkage between GPA and dropout that holds in Chicago Public Schools is not nearly as predictive in another context. Additionally, though not empirically testable in most cases, many EWS indicator systems simply serve to provide a numeric account of information that is apparent to schools in other ways -- that is, the indicators selected identify only "obvious" cases of students at risk of dropping out. In this case the overhead of collecting data and conducting identification using the model does not generate a payoff of new actionable information with which to intervene. More complex models have begun to see use perhaps in part to respond to the challenge of providing value added beyond simple checklist indicators. Unlike checklist or indicator systems, machine learning approaches determine the risk factors empirically from historical data. Instead of asserting that an attendance rate above 95% is necessary to be on-track to graduate, a machine learning algorithm identifies the attendance rate cutoff that that best predicts successful graduation. Better still, the algorithm can do this while jointly considering several other factors simultaneously. This approach is the approach I have previously written about taking in Wisconsin, and has also been developed in Montgomery County Public Schools by Data Science for Social Good fellows. In fact, the machine learning model is much more flexible than a checklist approach. Once you have moved away from the desire to provide simple indicators that can be applied by users on the fly, and are willing to deliver analytics much like another piece of data, the sky is the limit. Perhaps the biggest advantage to users is that machine learning approaches allow analysts to help schools understand the degree of student risk. Instead of providing a simple yes or no indicator, these approaches can assign probabilities to student completion, allowing the school to use this information to decide on the appropriate level of response. This concept of degree is important because not all dropouts are simply the lowest performing students in their respective classes. While low performing students do represent a majority of dropouts in many schools, these students are often already identified and being served because of their low-performance. A true early warning system, then, should seek to identify both students who are already identified by schools and those students who are likely non-completers, but who may not already be receiving intervention services. To live up to their name, early warning systems should identify students earlier than after they have started showing acute signs of low performance or disengagement in school. This is where the most value can be delivered to schools. Despite the improvements possible with a machine learning approach, a lot of work remains to be done. One issue that was raised in the piece in the Marketplace story is understanding how schools put this information to work. An EWS alone will not improve outcomes for students -- it only enables schools more time to make changes. There has not been much research on how schools use information like an early warning system to make decisions about students. There needs to be more work done to understand how schools as organizations respond to analytics like early warning indicators. What are their misconceptions? How do they work together? What are the barriers to trusting these more complex calculations and the data that underlie them? The drawback of the machine learning approach, as the authors of the CCSR report note, is that the results are not intuitive to school staff and this makes the resulting intervention strategy seem less clear. This trade-off strikes at the heart of the changing ways in which data analysis is assisting humans in making decisions. The lack of transparency in the approach must be balanced by an effort on the part of the analysts providing the prediction to communicate the results. Communication can make the results easier to interpret, can build trust in the underlying data, and build capacity within organizations to create the feedback loops necessary to sustain the system. Analysts must actively seek out feedback on the performance of the model, learn where users are struggling to understand it, and where users are finding it clash with their own observations. This is a critical piece in ensuring that the trade-off in complexity does not undermine the usefulness of the entire system. EWS work represents just the beginning for meaningful analytics to replace the deluge of data in K-12 schools. Schools don't need more data, they need actionable information that reduces the time not spent on instruction and student services. Analysts don't need more student data, they need meaningful feedback loops with educators who are tasked with interpreting these analyses and applying the interventions to drive real change. As more work is done to integrate machine learning and eased data collection into the school system, much more work must be done to understand the interface between school organizations, individual educators, and analytics. Analysts and educators must work together to continually refine what information schools and teachers need to be successful and how best to deliver that information in an easy to use fashion at the right time. Read about the machine learning approach applied in Montgomery County Public Schools. Learn about the ROC metric and how various early warning indicators have performed relative to one another in this paper by Bowers, Sprott, and Taff. Learn about the Wisconsin DEWS machine learning system and how it was developed. Read the comparison of many early warning indicators and their performance within Chicago Public Schools. The system is moving into its second year of use this fall and I recently completed a research paper describing the predictive analytic approach taken within DEWS. The research paper is intended to serve as a description and guide of the decisions made in developing an automated prediction system using administrative data. The paper covers both the data preparation and model building process as well as a review of the results. A preview is shown below which demonstrates how the EWS models trained in Wisconsin compare to the accuracy reported in the research literature - represented by the points on the graph. The accuracy is measured using the ROC curve. The article is now available via figshare. High School Journal, 96(2), 77-100. doi:10.1353/hsj.2013.0000. This article serves as good background and grounds the benchmarking of the models built in Wisconsin and for others when benchmarking their own models. The state of Wisconsin has one of the highest four year graduation rates in the nation, but deep disparities among student subgroups remain. To address this the state has created the Wisconsin Dropout Early Warning System (DEWS), a predictive model of student dropout risk for students in grades six through nine. The Wisconsin DEWS is in use statewide and currently provides predictions on the likelihood of graduation for over 225,000 students. DEWS represents a novel statistical learning based approach to the challenge of assessing the risk of non-graduation for students and provides highly accurate predictions for students in the middle grades without expanding beyond mandated administrative data collections. Similar dropout early warning systems are in place in many jurisdictions across the country. Prior research has shown that in many cases the indicators used by such systems do a poor job of balancing the trade off between correct classification of likely dropouts and false-alarm (Bowers et al., 2013). Building on this work, DEWS uses the receiver-operating characteristic (ROC) metric to identify the best possible set of statistical models for making predictions about individual students. This paper describes the DEWS approach and the software behind it, which leverages the open source statistical language R (R Core Team, 2013). 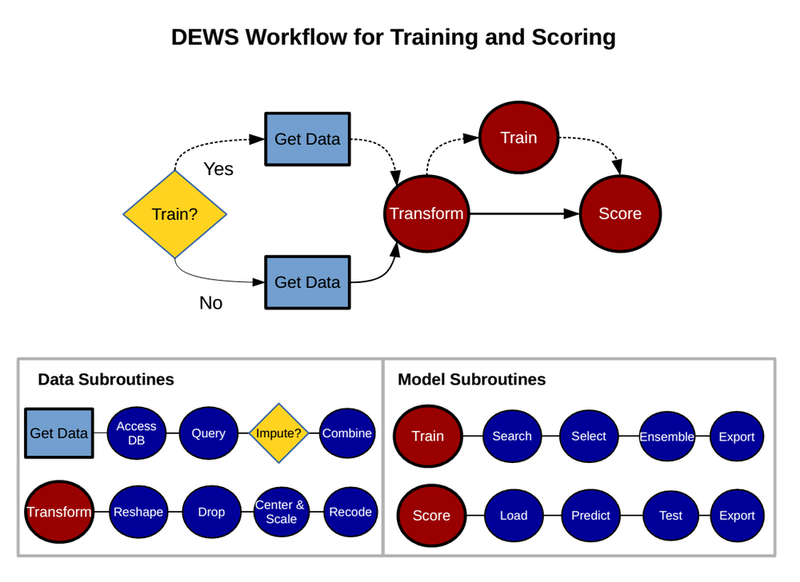 As a result DEWS is a flexible series of software modules that can adapt to new data, new algorithms, and new outcome variables to not only predict dropout, but also impute key predictors as well. The design and implementation of each of these modules is described in detail as well as the open-source R package, EWStools, that serves as the core of DEWS (Knowles, 2014). Not only is our education system being starved of investment, but many of our children are literally too hungry to learn. This sums up the problem, but it doesn't show the extent of it. One way to show the truth of this point and how dramatically things have changed is to look at state reported proportions of students eligible for Free and Reduced Price Lunch meals. FRL eligibility is set at roughly 160% of the poverty line and students qualifying for these meals are the students Blow refers to in his piece. For my work in Wisconsin I have spent a lot of time looking at the impact of increasing numbers of students FRL eligible in the state on education policy. Mapping this data can give a sense of the breadth and depth of the problem of children living in poverty, particularly in recent years. Luckily, the state of Wisconsin makes data on the proportions of FRL students in every school district available in an easy to download format. Additionally, a shapefile of the state of Wisconsin school districts is easy enough to find here. Using a GitHub repository (FRLmap), I have wrapped up the data necessary, the scripts necessary, and some code for downloading the shapefile to make the map below. Then all we need is R and a few trusty packages to draw the map. I won't explain all the code here (you can snag it from the GIST embedded below or the repo) but I did want to explain a couple of pieces of the code that are important. First, downloading the shapefile from a web source is not straightforward in R.
Here we need the "mode='wb'" argument to tell R to download and save the file as a binary instead of as a table. Otherwise, it will download the file with the proper extension, but the file won't behave as designed or have the properties necessarily to be read back in properly. Next, we have a crucial piece of code to merge the shapefile data with the data frame we downloaded. This little block of code is useful for merging up shapefile data and dataframes. @data indicates we want to create an object that pieces out our data from our shapefile. We then merge our data of interest (y), with the new dataframe created from the shapefile (d). After we do this, we resort the data and call spCbind to bring it back into the shapefile data structure. Finally, to draw the plot, we use fortify from the ggplot2 package to allow us to create a polygon object we can draw with ggplot2. The result is a striking graphic depicting the socioeconomic changes in Wisconsin over the last decade.